It’s increasingly difficult to find budget accommodation on Long Beach – but it’s not impossible. Ad Book now! Rates from US$30++. Average rating 6.8 from 262 reviews. Viet Thanh Resort has two small bungalows, rooms 21 and 22, which directly abut the beach, have a fantastic view and are 10 steps from the water. For some reason this is considered a cheaper category than the “beach” rooms to the side, which are ridiculously overpriced during high season. If you can live with just a fan and the basic furnishings, the cheaper rooms are the ticket. All of Viet Thanh’s cheerful yellow bungalows are basic but clean, with solid walls, terracotta tile floors and security bars on the window. Rooms are equipped with a table and chairs, mini-fridge, mosquito net and WiFi. The clean wetroom bathrooms are your typical tiled affair. 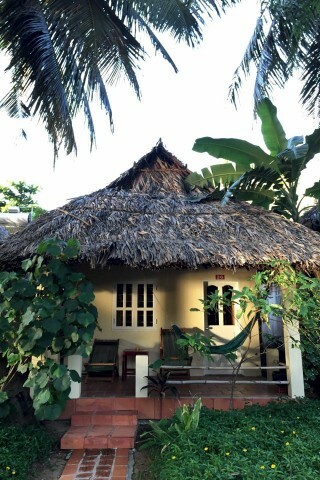 Some of the bungalows have been done up with air-con, a flatscreen TV, deck chairs and a hammock. It’s still a simple room, a backpacker option that costs more because it’s beachfront. Check rates at Viet Thanh Resort on Booking.com.